A photo is taken every 5 minutes from 5 a.m. to 9 p.m. (Hong Kong Time). Animation normally displays photos taken during the past 3 hours. Between 9 p.m. and 5 a.m. the next day, photos taken from 6 p.m. to 9 p.m. are displayed." This means, sunset animations of YSW harbour, available all night! Hong Kong (HKSAR) - The Hong Kong Observatory has enhanced its regional weather information service by adding real-time weather photos taken at Lamma Island to its website starting from today (June 26). The new camera, located at the Yung Shue Wan pier at Lamma Island, overlooks the West Lamma Channel to the east of Lantau Island. Weather photos taken by the camera help monitor weather conditions such as sea fog over the local waters around Kau Yi Chau, Hei Ling Chau and northern Cheung Chau. During periods under the influence of tropical cyclones, the photos will also assist ferry operators to view the state of the sea in the West Lamma Channel. The Senior Marine Officer of the Marine Department, Mr Wong Wing-hung, welcomed the Observatory's initiative to provide real-time weather photos taken at Lamma Island. "The West Lamma Channel is one of the main waterways of Hong Kong. The newly added real-time weather photos provide a useful reference for ship masters to assess weather and sea-state situations, thereby enhancing the safety of navigation in these waters," he said. The General Manager of the Hong Kong and Kowloon Ferry Holdings Limited, Mr Nelson Ng, said, "We welcome the Observatory's provision of real-time weather photos taken at Lamma Island. The information provides an additional reference for our ferry services." With the addition of weather photos taken at Lamma Island, the number of sites providing weather photos on the Observatory's website has increased to 21. 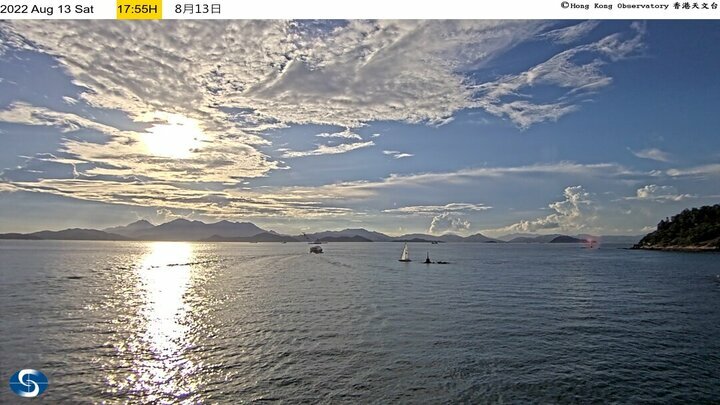 Members of the public can access the weather photos through the Observatory's "Regional Weather in Hong Kong" webpage (http://www.hko.gov.hk/wxinfo/ts/index_e_webcam.htm) and mobile platform webpage (http://m.hko.gov.hk/wxreport/wxphoto.htm). MyObservatory, the smartphone weather service application, will also make available the real-time weather photos taken at Lamma Island in its next update." Post subject: Visibility monitor too! With your handy dandy annotated picture giving distances to the various landmarks we can now take objective measure of the fog/mist/smog/haze/crap (*delete as appropriate) in our air. Linked from the right column of our home page, of course.